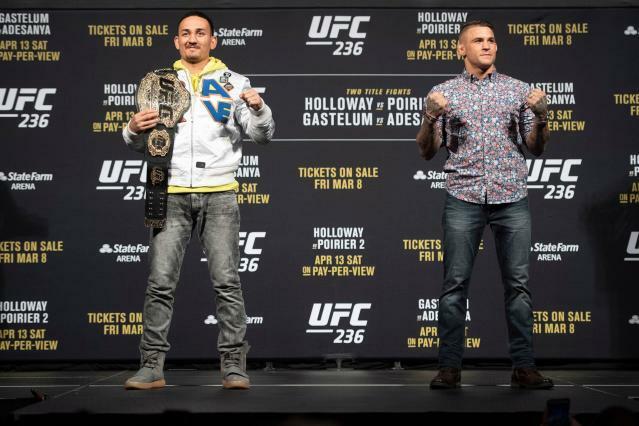 Who wins UFC 236 title fights between Max Holloway-Dustin Poirier and Israel Adesanya-Kelvin Gastelum? One of the things that is fun to do occasionally is to go back and look at an old UFC card and see how many current big names and/or elite fighters competed on it. One of the best examples of this isn’t all that long ago in the past. At UFC 178 on Sept. 27, 2014, in Las Vegas, the following fighters appeared, even though the planned main event of Daniel Cormier vs. Jon Jones didn’t occur: Demetrious Johnson, Donald Cerrone, Eddie Alvarez, Dustin Poirier, Conor McGregor, Yoel Romero, Amanda Nunes, Cat Zingano, Dominick Cruz, Jorge Masvidal, Stephen Thompson and Kevin Lee. Has there ever been a finer collection of mixed martial artists competing on the same card? I’d love to see the card that had more talent than that one. Sure, McGregor was still 10 months away from winning the interim featherweight title and it would be more than a year until his dramatic 13-second knockout of Jose Aldo that made him a legend, but it was obvious in 2014 that McGregor was something special. Two fighters lost that night who would go on to accomplish extraordinary things in the UFC. Alvarez was beaten in his UFC debut by Cerrone, but would not only go on to win the lightweight title, but he became one of the promotion’s most exciting fighters. And Nunes rebounded from that loss to Zingano to become not only the women’s featherweight and bantamweight champion but to also earn recognition as the greatest female MMA fighter of all-time. I thought of all of that as I pored over the fight card for UFC 236, which is Saturday at State Farm Arena in Atlanta. It features two athletes who have the ability to be generational fighters in featherweight champion Max Holloway and middleweight contender Israel Adesanya. Holloway already is regarded as one of the best fighters in the world, and he’ll take a huge step forward toward meeting his goal of becoming regarded as the best pound-for-pound fighter in the UFC if he defeats Poirier when they meet for the interim title. The winner is expected to fight champion Khabib Nurmagomedov for the undisputed title later this year. Win these next two and Holloway will be as big as it gets in MMA. But, the way these things go, he may not be bigger than Adesanya, who has the elite talent but also that gift of gab for promoting and selling both fights and himself. Adesanya will challenge Kelvin Gastelum for the interim middleweight belt Saturday, with the winner fighting champion Robert Whittaker for the undisputed belt when Whittaker is healthy. Adesanya is one of those rare guys who comes along once a decade, maybe once every five years if we’re lucky, who is a transformative figure much like McGregor and Ronda Rousey were. He has that kind of talent, that kind of instinct and that kind of charisma. Of course, Adesanya needs to win this fight in order to take the next step down that path. Rousey and McGregor won those big fights en route to stardom. For Adesanya, this bout is similar to Rousey’s first bout with Miesha Tate, which was contested in Strikeforce. Rousey had been dominant to that point in her career but Tate was by far the most difficult opponent she’d faced. Tate was a known commodity with an all-around game and toughness to boot. Rousey submitted Tate in the first round with her arm bar, and was in complete control of the first. Her striking deficiencies, which effectively ended her career, weren’t a factor. Much the same way as striking questions always followed Rousey, grappling questions follow Adesanya. He’s a striker of quite some pedigree, so much so that he was able to outstrike Anderson Silva. Now, it wasn’t vintage Silva but it was still a guy comfortable on his feet and Adesanya outstruck him. Gastelum has a tough chore because he has to get the fight at a middle distance, and getting there won’t be easy because of Adesanya’s massive reach advantage. Adesanya has been a master at controlling the distance, using his long arms and legs to do so. 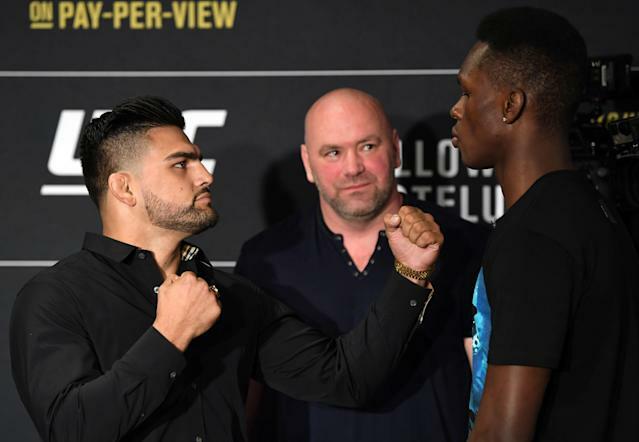 Gastelum, though, is used to fighting much bigger men, and so he has experience slipping to the inside where he not only can land his strikes more effectively but where his ability to take Adesanya down becomes more realistic. Adesanya is about a 9-5 favorite, and look for him to win a decision in a fight in which he gets better as it goes on. Gastelum will give him fits early, but Adesanya is one of those rare athletes and he’ll find a way to adjust. As for Holloway, Poirier is about as tough of an opponent he could have gotten to make his lightweight debut against outside of Nurmagomedov. Holloway likes to fight at a measured pace early, as he gets a feel for his opponent, while Poirier is more like a whirlwind who explodes out of the gate. Poirier submitted Holloway seven years ago in what was Holloway’s UFC debut, and concedes that bout will have little impact on the outcome of Saturday’s bout. This has a classic written all over it. It’s incumbent upon Holloway to keep a jab in Poirier’s face and not let him charge relentlessly forward. If Poirier backs Holloway up all night, the fight is going to go his way. But I figure Holloway finds a way to blunt the charge and use his varied skills to eke out a decision, setting up a mega-fight with Nurmagomedov. This is one of those cards where both title fights have the ability to go either way. Adesanya and Holloway, though, are cut from a different cloth than most and that special something is going to lead them to wins in fights that may be talked about for years after they’re over.